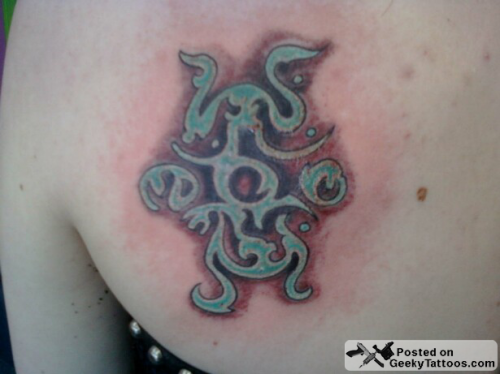 For my very first tattoo I had to go with one of my all time favorites Shadow of the Colossus. I spent forever trying to get this down just how I wanted it. There were virtually no direct camera shots from the game’s box art, game guide or anywhere I looked online. The best representation of the vitality symbol was of Wander’s tunic, and that was just too symmetrical. It wasn’t until the team Ico pack came out for LBP that I was able to trace the symbol right off the screen. My tattoo artist Jay helped smooth it out and make it look pretty. I am very proud to rock a tat that most other video game junkies won’t recognize. 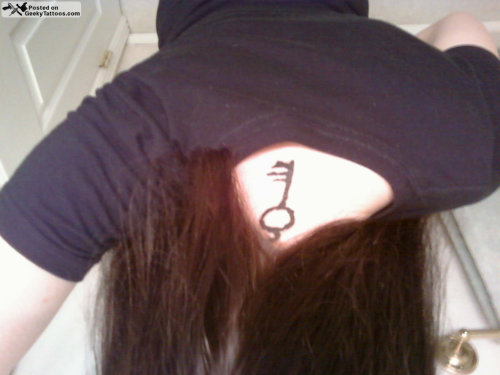 My second tat ended up being the key to hell from the Sandman series. I’m a huge Sandman/Neil Gaiman fan and although it’s a fairly common Sandman tattoo, I just had to have it! She got both tattoos done at Spit Shade Ink by Jay. Tagged with back, neck, Sandman, Shadow of the Colussus, shoulder blade. love your shadow tattoo! its freakin amazing!